A three-floor Igor PoE lighting install project results in immediate 69% reduction of energy costs for local apartment complex. Do you remember to turn off the lights every time you leave a room? A new smart light program can learn your behaviors and automatically adjust the schedule to save you money. This special PoE lighting technology was created right here in Iowa. Two Iowa-based companies partnered together on a successful energy efficiency project completed in September, 2016. The Power-over-Ethernet (PoE) lighting company, Igor Inc., joined forces with Haverkamp Properties on an energy reduction project to convert three floors of a Haverkamp apartment building from high-voltage fluorescent to low-voltage LED lighting using Igor’s PoE system to both power and control the new fixtures. How Much Energy Can PoE Lighting Save? The new lights are projected to eventually achieve an 80% reduction in energy costs annually due to Igor, Inc’s smart software system that learns and improves efficiencies as time progresses. The software can harvest natural light, respond to darker days by increasing the lumen outputs, and has been programmed to maintain specific lighting standards to comply with state and federal safety requirements. With these programs and the new fixtures, an entire floor of low-voltage light fixtures with Igor controls now consumes less energy than a single high-voltage lighting fixture previously found in the complex. 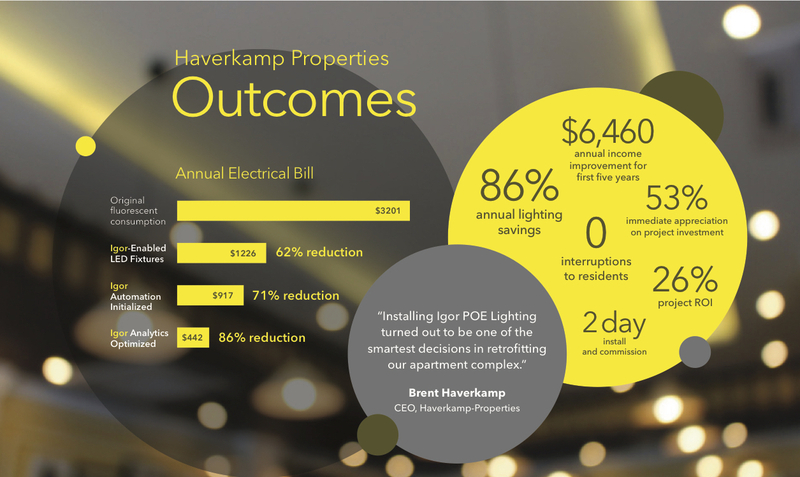 As a result of the installations, peak lighting demand dropped from 5.22kW to less than 1.6kW and daily energy expenditures have dropped from 125kWh to less than 37kWh, providing an immediate ROI for Haverkamp Apartments.